Unlike a lot of craft brew fans, I'm not terribly fond of hop-forward styles. I'd much rather have a Belgian Trappist ale or a good German lager than an IPA, American Pale Ale, or "Imperial" something-or-other. One of the beer styles I really enjoy is the Scottish Ale, though until today I hadn't brewed one. All the grain, whether pre-crushed or not, was run through my Cereal Killer mill to ensure a proper and somewhat consistent crush. 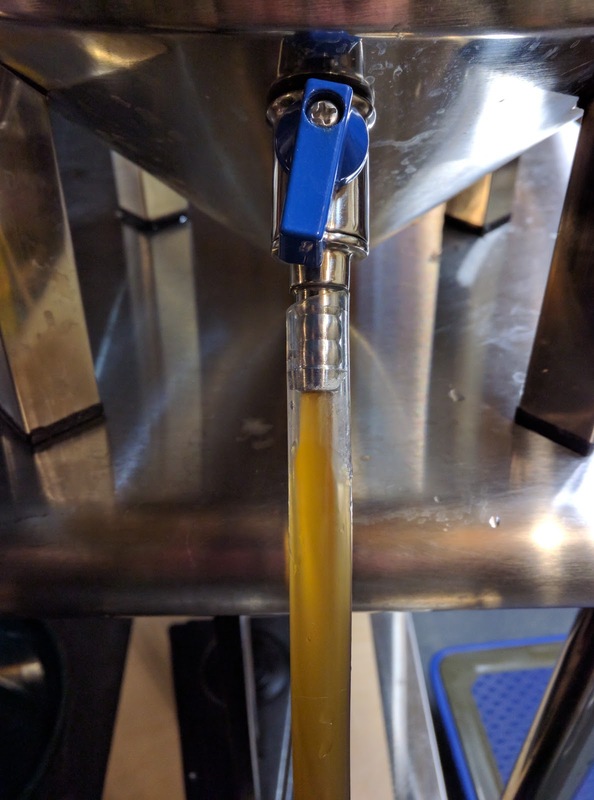 Per the formula for The Grainfather and my own experience with the system, I calculated that I would need 4.5 gallons of mash water and 3.75 gallons of sparge water to produce a 6-galllon finished volume of beer. 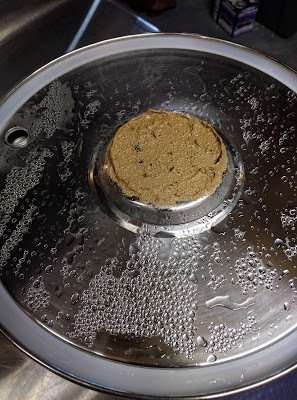 I put 4.5 gallons in The Grainfather kettle and dropped in a Campden Tablet to remove chlorine and chloramine. I also put one in the sparge water kettle and filled it. A 90-minute mash at 157F was performed with the grain bill, followed by a 10-minute mash out at 167F. The sparge water was heated to 167F and the grain batch sparged into the kettle. Post-sparge the the kettle contained just over 7 gallons of wort. I added some water to top it off at the needed 7.3 gallon mark my calculations called for. 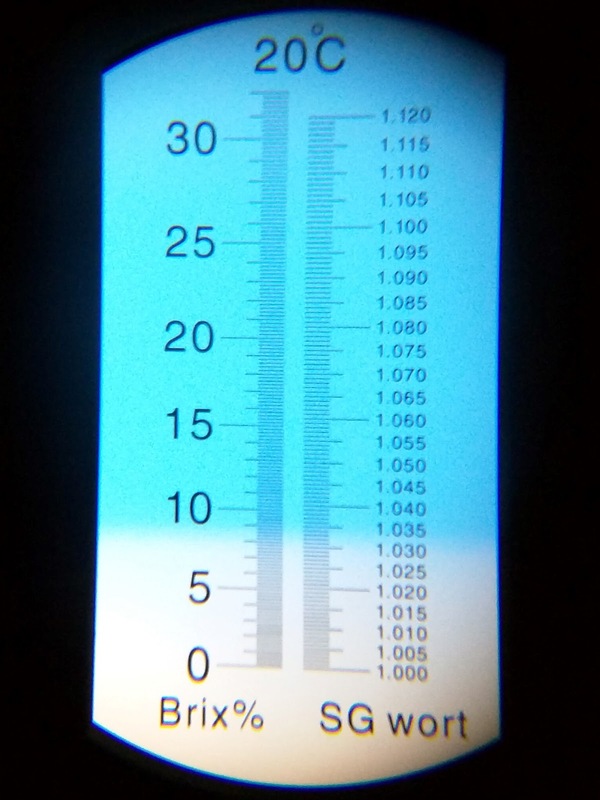 I stirred the wort well and took two or three gravity readings with a refractometer. All three readings came up at 13.1 Brix, versus the expected 11.7 Brix. Clearly I've become more efficient at mashing than I've been in the past. A 60-minute boil began. Due to the large wort volume, it took The Grainfather quite a while to get up to the boil. Once there, I stirred it to keep ahead of the foam until the foaming stopped. I then began the 60-minute countdown. 10 minutes: Add the East Kent Goldings and Yeast Nutrient. Start recirculating wort through the counter flow chiller to sterilize it. 0 minutes: Switch off the heat, switch off the pump, and run cold water through the counter flow chiller to cool it down. Then move the output hose to the sanitized fermenter and pump the wort into the fermenter. Owing to the efficiency of the chiller and the temperature of our cold water supply, wort entered the fermenter at 64.9F, right at the low end of the yeast's optimal range. I pitched the yeast and a vial of White Labs Clarity Ferm and sealed the fermenter. This gradual climb should allow the yeast to finish out fermentation well without stressing it unnecessarily. 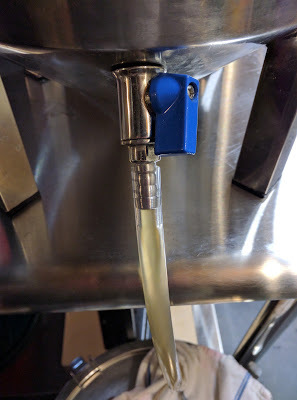 I attached a fermwrap fermentation heater to the fermenter and plugged it into the Inkbird controller's heat port. After primary fermentation is complete, I plan to transfer the beer to a clean and sanitized secondary fermenter and pitch in some gelatin to clarify the beer some more. I'm hoping to enter this brew in a competition and want it to look and taste its best. Grain Crush - For the Quad, the grain bill consisted mostly of a malt I crushed myself. Later, I discoverer that my mill had a larger gap between the rollers than it should have had, so I adjusted that for the other three batches and efficiency improved. Mash Thickness - The Quad had a thicker mash and the largest grain bill of all. Grainfather Efficiency - I've heard that The Grainfather delivers greater efficiency for grain bills of a certain size, and lower efficiency above and below that. Lately I've been keeping stats on the grain bill in pounds, the brew house efficiency of the finished wort as calculated by BeerSmith, mash time, and mash thickness. There hasn't been much correlation so far, but I'm hoping to find out what's causing it in time. My primary suspect at this point is the grain crush. The batches I've made since adjusting the mill have been more efficient. April 24: The ale has been fermenting now for approximately nine days. The airlock activity has been relatively mild and slow compared to other yeasts I've used. Despite the fermenter being more full than I often have it, there has been no blow-off through the airlock and no unexpected mess as there was with the Australian ale yeast I recently used. The temperature control system has not needed to cool the beer at all, Although I am very interested to see how this one is coming along, I've resisted the urge so far. Given how "slow and steady" this fermentation has been, I am hesitant to do anything to interrupt or interfere with it. May 10: The beer has been moved to two secondary fermenters. One is being treated with oak chips soaked in bourbon, to give me about 2.5 gallons of a bourbon barrel Scottish Ale. The other half is untreated and being allowed to brighten up a bit before bottling. When I tasted some of the bourbon barrel portion last night, it had a nice bourbon flavor but had not picked up much of the oak flavor yet. My plan is to taste a small sample each night until I'm happy with the oaky notes. Then I'll bottle the beer. The untreated beer will probably be bottled first. May 12: The 2.4 gallons treated with oak and bourbon achieved the subtle flavor I was hoping for, so I bottled that portion of the batch with carbonation drops since I was in a hurry. May 13: The 3 gallons not treated with oak and bourbon were bottled with corn sugar today. Both versions were labeled and placed in my 76F "hot box" to accelerate carbonation. I should have tasting information as soon as next weekend. May 22: The beer has been bottled for about a week now. It's very mildly carbonated at this point. If poured hard enough, it generates a nice beige head that lasts a little while. The aroma is a nice balance of malt and hops, as is the flavor. The BJCP style guidelines say the aroma should be one of low to medium maltiness, with earthy hops aroma, which I get from it. Hops flavor is low, as the guidelines suggest, and there is a malty flavor to the beer. It seems like a good representative of the style. June 10: I received the comments from the judges at the state fair today. They weren't too impressed with it, which was disappointing, but did provide good feedback. 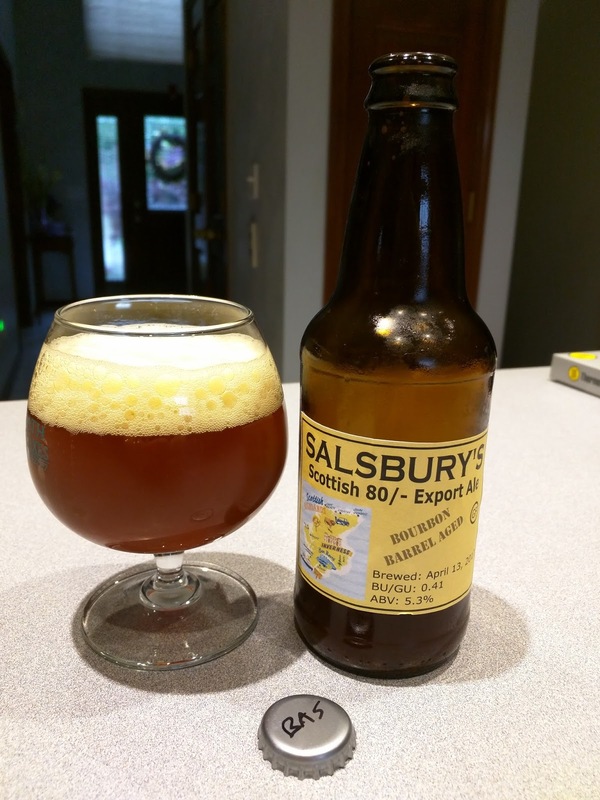 Seeing that this was the first time I've ever tried to brew a Scottish Ale, I'm not surprised that the comments and ratings were relatively low. This would address the comments I received from the judges as best I can. In September 2015, I read an article in BYO magazine about the Australian Sparkling Ale style, which included a recipe for the beer. The main characteristics of the style are the use of Australian hops, particularly Pride of Ringwood hops, a more dry flavor, and lots of carbonation. 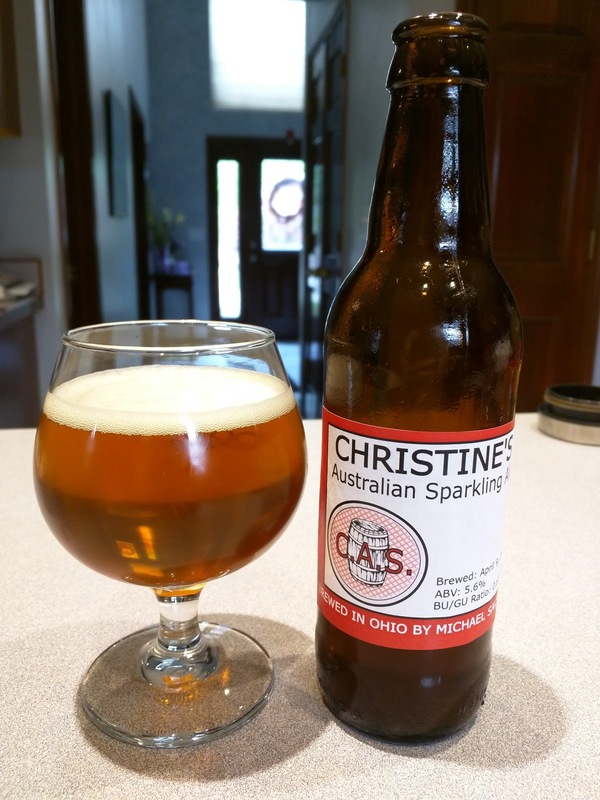 Update 06/04/2017: This beer took second place in its category at the Ohio State Fair's 2017 Homebrewing Competition. It was one of five beers I took to the fair and the first time I've competed in any brewing competition, so seeing the beer do so well is very exciting and makes me feel better about the effort I've put into improving my brewing process and learning about brewing. At the Barley's Homebrewing competition the next day, it didn't fare quite as well, getting scores of 30 and 34 out of 50. 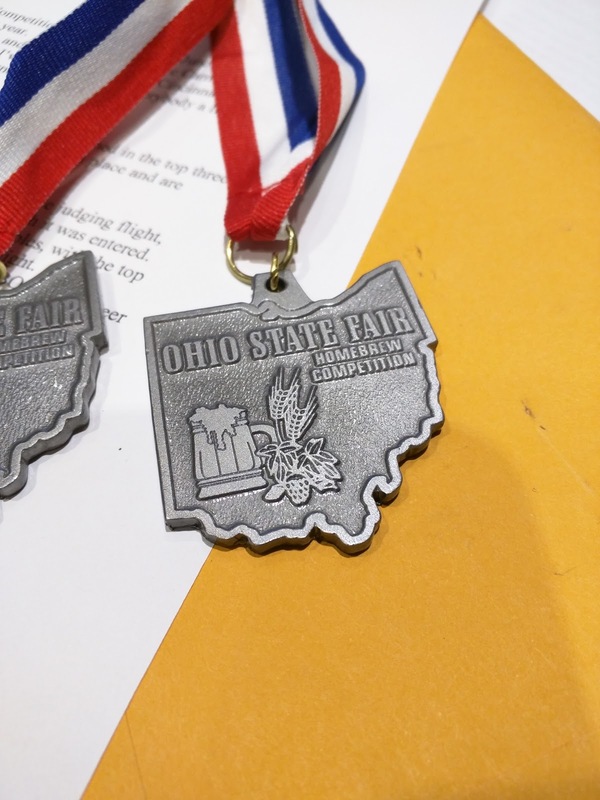 At the Ohio State Fair, it received an official score of 36 and individual scores of 35 and 37. This beer was brewed in iMake's The Grainfather RIMS system, so mash and sparge amounts are based on the vendor's formula. 3.25 gallons of mash water were heated to 144F and treated with half of a Campden Tablet to remove chlorine and chloramine. This was expected to yield 7.3 gallons at 7.3 Brix (1.029 SG). The actual yield was 7.3 gallons at 7.9 Brix. 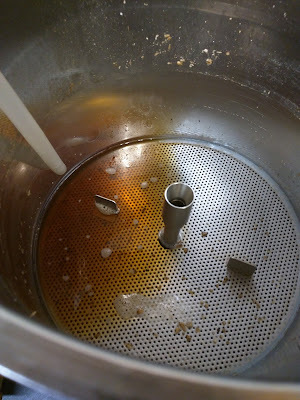 The Grainfather's recirculating arm leaked after I walked away from it, spilling possibly as much as 12 ounces of wort on the floor which had to be cleaned up. I'm still trying to understand why this has happened recently, usually only after several minutes of no leaking. While still sparging, you should have added the bittering hops. This yielded a little over 6 gallons in the fermenter at 11.5 Brix, exactly as expected. A heat wrap was taped to the fermenter and connected to the InkBird. Given the low ambient basement temperature I opted not to use a cooling device on this batch. 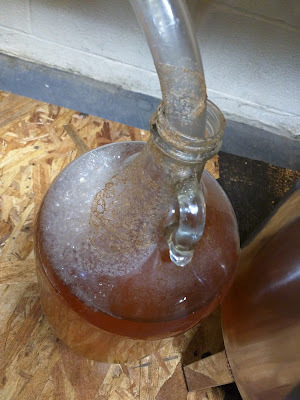 Given how full the fermenter was, I attached a blow-off tube and snaked it into a half-gallon of water in a gallon jug. After this, I cleaned all the items used during brewing, including The Grainfather itself. 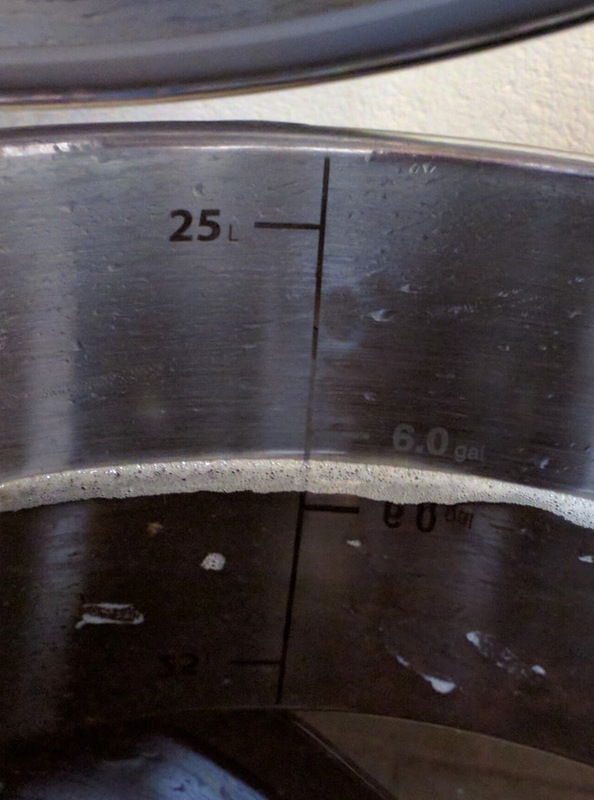 Update 04/14/2017: Cooper's Ale Yeast is a monster to ferment with. At the height of fermentation, it blew beer and yeast through the blow-off tube, into the jug of water, out of the top of the jug of water, across the shelf on which the jug sat, and expelled enough liquid to send a stream about four inches wide from the fermenter's location to a drain in the basement floor about ten feet away! I've never had any brew expel so much. The water jug's contents are now a rich brown with about a quarter inch of yeast across the bottom. The blow-off jug looks like it's brewing its own beer (and it may be). Yeast mess in the blow-off jug and tube. Note how dark it got the water! Update 04/15/2017: Checked the gravity today. As you'll see in the image below, my refractometer registered somewhere in the 4.5 to 5.0 Brix level. That works out to a final gravity in the ballpark of 1.004SG and an alcohol content around 5.6% ABV. This is higher than I expected for the brew. I was expecting an alcohol-adjusted reading in the vicinity of 5.7 Brix, so it's safe to say this beer attenuated extremely well. I did this after transferring the beer to a sanitized secondary fermenter. I also kept a large sample of the yeast for future use. Since the beer was still quite cloudy (which isn't out of line for the style) I decided to pitch some gelatin finings and cold crash it to see if I could clear it up a bit. I'm planning to calculate 3.1-3.2 volumes of CO2 for this one and prime accordingly. The sty;e guide calls for priming from 3.0 to 3.5 volumes. I'm concerned based on things I've read that carbonating it to 3.5 volumes could burst the bottles, so I don't plan to go quite that high. Apart from the leakage of wort from the recirculation arm, which has happened on a couple of recent batches for reasons unknown, this brew went off without a hitch. The morning before I brewed it, I weighed and crushed all the grains. The gap between the rollers in my crusher seemed large, so I adjusted it down to a smaller setting, which seemed to work very well. My efficiency for the batch was measured at 79.7%. The original recipe in BYO called for using distilled or RO water and adjusting it to match Australian chemistry. I probably should have done that but didn't want to take the time. It was brewed with standard Hilliard, Ohio, tap water with Campden to remove chlorine and chloramine, but nothing else. I'm expecting to move this to secondary on April 15, then add gelatin finings and chill it. I'll plan to bottle it some time during the week of April 17, 2017. After two weeks in the bottle, I'll chill some and see how the carbonation, clarity, and flavor turned out. So expect an update in early May. Update 04/14/2017: A sample of the beer extracted earlier in the week showed that there is absolutely no residual sweetness to the brew. It was incredibly dry, a bit cloudy, and mildly to moderately hoppy. April 20: The beer spent several days in the mini-fridge with gelatin finings and is now nice and clear. I decided to bottle it and place it in a 72F "hot box" to carbonate. I'm expecting to be able to try my first bottle later this week to confirm that it's carbonating properly. May 10: The beer has been shared with coworkers and family. Those who have reported back have told me they really liked it. Although I am not a certified beer judge, when I compare the beer against the official criteria for the style, I think it hits all the important notes. It's brilliantly clear, has a nice coppery golden color, lots of carbonation, a creamy white head that lasts a while, an aroma that hints at iron and fruit, and a flavor that seems to showcase the Australian yeast and the Pride of Ringwood hops. I'm really pleased with it. May 22: Perhaps the best thing I can say about this beer is that I've chosen to enter it in two different homebrew competitions this year. One is a more local competition, while the other is state-wide. I won't know until mid-to-late June how well it's done in the competition, but you can be sure I'll come back to share the results of judging. Mouthfeel: Light body, spritzy effervescent carbonation, light stickiness and/or creaminess in the finish. Score: 4/5. Overall Impression: No off flavors or aromas perceived except for some oxidation. Beer seems a little aged with the malt/hops being muted. Try rebrewing and entering younger if beer was old. Score: 6/10. Source fresher ingredients: I had a good dialog with one of the judges by email. He said that he remembered the beer because it was unusual and that his comments about oxidation were more from the possibility of stale grain than from mishandling during transfer and bottling. It's likely that some of the grain I used to brew it had been in storage for a while. He suggested six months for base malts is as long as you should store it, and no more than a year for specialty malts. That will be my rule for any beer made for competition from this point on - base malts and hops need to be as fresh as possible. Boost the hops additions: While I followed the hops schedule in the original BYO Magazine recipe, the judges clearly felt it should have more aroma and flavor, and I tend to agree. Maybe because it took me a while to source Pride of Ringwood the beer suffered due to older hops. Maybe it just needs a boost in amount. Either way, I need to improve the hops aspect next time as it's a critical element of the style. Drop the mash temp a little: Cooper's Ale Yeast seemed pretty voracious and active, but the beer was a touch sweeter than it should have been. I think keeping Cooper's yeast is probably still the right move, but I need to drop the mash temp to make the wort a little more fermentable and use my full temp control system to help keep the yeast under control. Shift the base malt balance slightly: I think I might shift the base malt balance a little, too. Maybe changing from 50/50 Pilsner and Two-Row Pale to more like 40/60. I think these changes would dry the beer out a little, improve the hops flavor, and make it better overall. A little over a year ago, I brewed a variant of the "Dixie Cup Boardwalk Belgian Quadrupel" that appeared in a 2007 issue of BYO magazine. It turned out to be one of the tastiest beers I'd ever brewed, and I think I have no more than a bottle left... and that's only because I jealously protected it to ensure it would still be around when I brewed it again. Use temperature control to minimize the "burn" from the high alcohol, keeping the beer at or below 72F during the early stages of fermentation (and ramping up the temp later to encourage the formation of esters). Correct my sparge water calculations so that I hit the target volume and gravity. Use two full pounds of D-90 syrup (I had a partially used container last time that I had thought was a full pound but wasn't). Note: After considering all the adjuncts in this recipe I decided against this. Dial the hops back by about 10%. 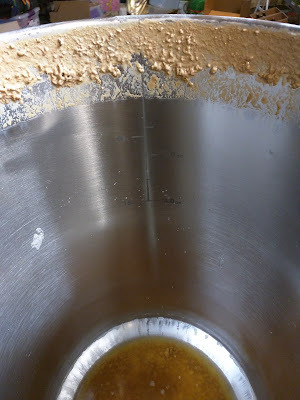 This will be a 12% adjunct beer, which is well within Belgian style guidelines and shouldn't stress the yeast too much. This was brewed using iMake's The Grainfather RIMS system. Using their mash and sparge calculations, I put 6.5 gallons of water into the kettle and dropped in a Campden Tablet to remove chlorine and chloramine. I put 1.75 gallons of sparge water into the sparge kettle and part of a Campden Tablet to treat that as well (actually since there's a gallon of dead space in my sparge water kettle, I put 2.75 gallons and half a Campden Tablet - your mileage would of course vary). The mash water was heated to 152F. 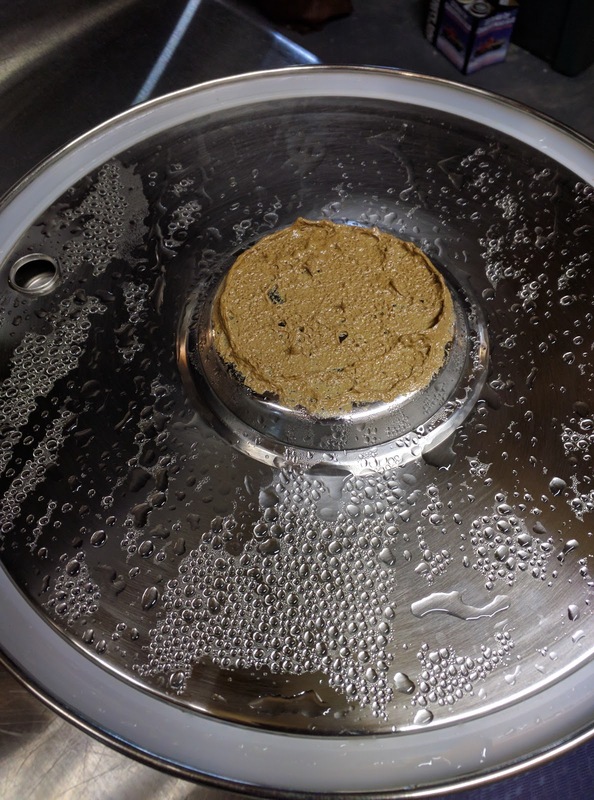 The grains were crushed and stirred into the mash water a few scoops at a time to ensure proper moistening. The lid was placed over the mash tun and the recirculating arm attached. A 90 minute mash was then performed at 152F. After 70 minutes of the intended 90 minute mash, I did an iodine test. It showed complete conversion, so I decided to terminate the mash and begin the mash out. The temp controls were set to 168F. When the temp was reached, I waited 10 minutes and then removed the grain basket. I also set the temperature controls to heat the wort to 200F to save time bringing it to a boil later. 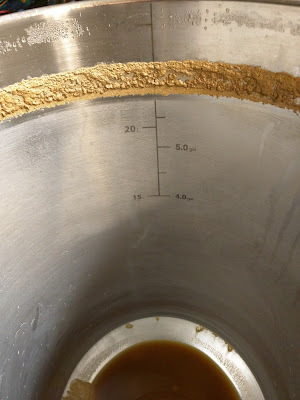 It took the grain bed about 20 minutes to drain and sparge, by which time the kettle had heated to approximately 185F. The yield was 6.75 gallons, compared with the 7.3 gallons expected. Water was added from the sparge kettle to get volume up to the expected level. Original gravity was then measured at 14 Brix, well below the expected 17.3. I've heard that The Grainfather's efficiency drops with larger grain bills, and that might be what's happening here. It's also possible that BeerSmith calculated that gravity on the assumption that some of the brewing sugars were malt extracts (I noticed one listed that way). I decided not to sweat it too much. 90 minutes - Nothing added to the kettle, just the boiling wort. This part of the boil was intended to help clarify the beer. 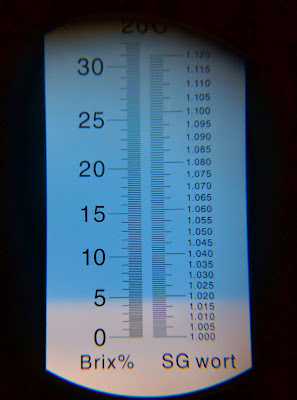 A gravity reading taken during the early rolling stage of the boil yielded a reading of 14.1 Brix again. 60 minutes - Added the 1.1 ounces of German Northern Brewer hops pellets in the hop spider. Gravity increased to around 14.3 Brix at this point and volume dropped below 7 gallons. Removed a sample of wort to rehydrate the Super Irish Moss. 20 minutes - Added the chopped raisins to the hop spider. Wort volume was down to 6.6 gallons at this point (just a touch under 25 liters). Gravity had increased to about 15.6 Brix. 10 minutes - Added Saaz, Goldings, Yeast Nutrient, and Super Irish Moss. 5 minutes - Added the D-90, Turbinado, Brun Fonce, Grains of Paradise, and Coriander. With 3 minutes left in the boil, the gravity registered 19.0 Brix. Still below the estimated 20.9. 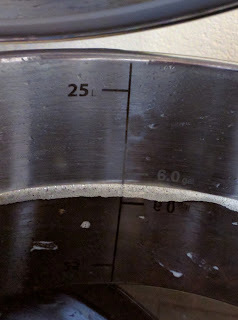 The expected kettle volume post-boil was 6.7 gallons at a gravity of 20.9 Brix. The wort was pumped from the kettle, through the counter flow chiller, into the sanitized fermenter. The expected fermenter volume was 5.8 gallons at 20.9 Brix. Actual was 6.0 gallons at 19.0 Brix. According to BeerSmith, this corresponds to an efficiency of 74.7%. The wort reached the fermenter at 68F thanks to the chiller. The wort was oxygenated for 60 seconds with pure oxygen and a stone. White Labs Clarity Ferm and ECY13 Yeast were pitched into the wort and a blow-off tube attached to the fermenter. April 1-15: Ferment in the primary with temperature control set to keep the beer between 66F and 72F, heating or cooling as needed to stay within the range. April 15-22: Transfer to a secondary fermenter and raise the temperature to 76F for one week. April 22-25: Add gelatin finings and move to a mini-fridge to chill as close to 32F as possible for three days, to further clarify the beer. After this, the beer would be bottled with the goal of 3.0 volumes of CO2. Update 04/15/2017: Fermentation is definitely finished. No airlock activity. No visible yeast floating on top of the brew, and the refractometer reads about 8.5 Brix, My expected final gravity was 9.9 Brix. This works out to an estimated 9.54% ABV, which is higher than the 8.5% I expected. Since I also transferred my Australian Sparkling Ale to secondary today, it yielded an interesting comparison between the two yeasts. Despite this beer having a much higher gravity and a lot more sugar to ferment out, it made relatively little mess compared to the Cooper's Ale yeast. To further compare the two, the Quad didn't use anything other than an standard canister style airlock. The Australian Sparkling Ale had a large bore blow-off tube and glass jug. Despite all that breathing room, the Australian beer blew out through the tub, blew beer into the jug enough to turn its water medium brown, blew beer out the top of the jug onto the shelf, the floor, and across the room into the drain. There wasn't any exterior mess from the Quad. Moral of the story: Coopers Ale Yeast needs a lot more headspace and breathing room than Safale T-58. 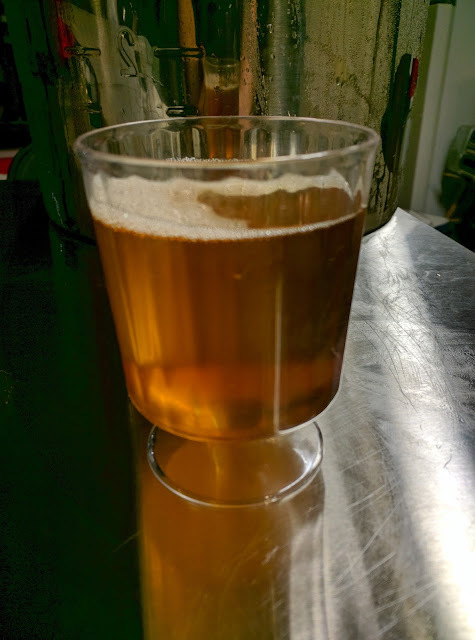 April 15, 2017: Given that a sample extracted from the primary was quite cloudy, I decided to use gelatin to fine the beer before bottling. Since my mini-fridge is currently busy fining the Australian Sparkling Ale, I'm going to try an experiment. The gelatin will be added to secondary while it's left out at ambient basement temperature (around 65F) until the mini fridge is available to cold crash the Quad. I'll take a sample from the fermenter then to see if it's clarified at all, and again after it comes out of the mini fridge later on. In theory the gelatin will do some good at room temp, but really have the most effect when the beer is colder. Sample from primary. Note it's relatively cloudy. The last batch of this beer was one of my all-time favorites, so I decided to go with a larger batch size this time around. Although 16.5 pounds of grain is within The Grainfather's 20-pound limit, it does seem to "push" the system. Wort tended to go down the overflow tube more than through the grain bed this time. Efficiency seemed to suffer as a result. The last time I did this recipe, my efficiency calculated out at 71.9%. This time it was 74.7%. This leads me to think The Grainfather is much less efficient with larger grain bills. I typically see efficiency in the 80% range with most batches. Two days after the brew started, there was no activity in the airlock. 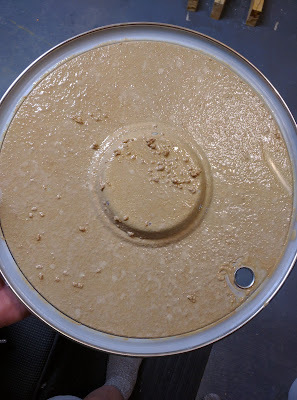 Opening the lid showed no krausen either, indicating the yeast was in fact not viable. I added a packet of White Labs Bastogne yeast that was still reportedly viable and a packet of Safbrew T-58. The next day the airlock was actually rattling audibly from all the yeast activity. April 9: It's now approximately a week since I brewed the beer and airlock activity has slowed considerably. 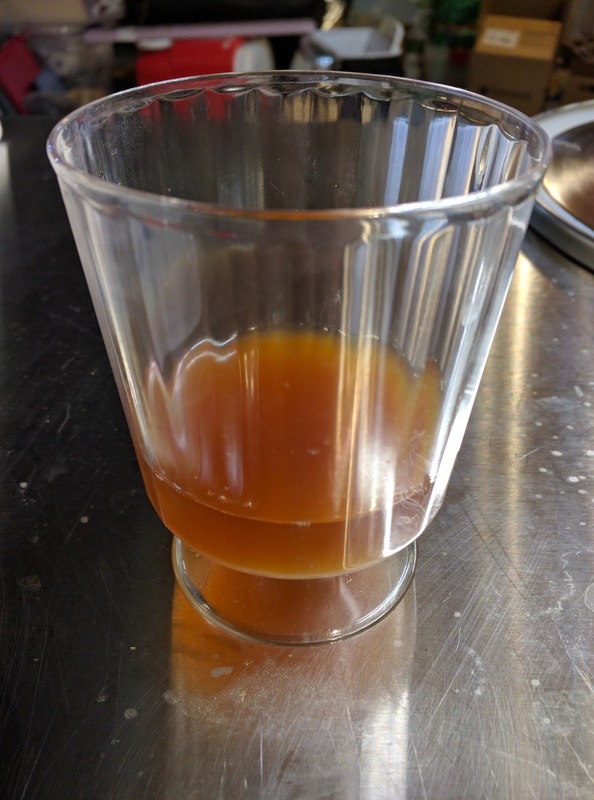 A sample extracted from the fermenter was very cloudy, but had the expected reddish-brown color. It also had a noticeable hops bitterness to it, more so than v1.0 did. April 15: The beer is a nice reddish medium-brown color. It's still quite cloudy, which I will probably correct with some gelatin finings since I want to enter the brew in competition and want it to look good. Since my mini-fridge is busy cold crashing the Australian Sparkling, I may not bother with the gelatin for a few days. A taste sample of the beer shows a good Belgian dark fruit flavor and aroma, with none of the burn I felt from the first version of the recipe. It does seem to have a little residual sweetness, which I was hoping for. I'm as happy as I can be with it until it's been bottle conditioned and I get a taste of the finished product. April 24: The beer has been in the mini-fridge since Thursday and is finally beginning to clarify. I'm planning to give it another day or two before bottling. The aroma is one of bubblegum and plum or prune. The flavor is more mellow than it had been, and less bitter. May 13: The bottles were removed from the "hot box" today and labeled. I will be chilling and doing a taste test soon. I'm also planning to do taste tests on this one approximately monthly to see how it improves with age. May 14: Below you see images of the final beer. 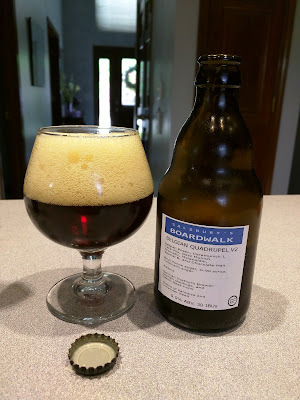 It's got a nice clear mahogany color and (in this particular bottle that included a carbonation drop in addition to priming sugar) a nice thick and creamy beige head that lasts quite a while. 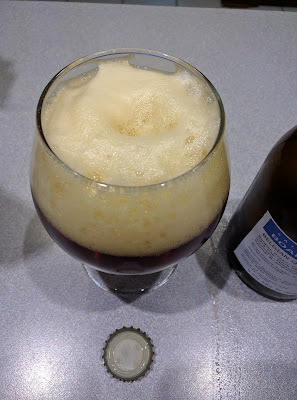 I find that a combination of Cara-Pils and Melanoidin malts make for an almost whipped cream like head of foam. The aroma is a little yeasty with some dark fruit hints. The flavor starts with sweet malt, then dark fruit flavors come up in the middle. The finish is a bit bitter, with a harshness to it that may come from the Northern Brewer hops. I'm planning to age this at least six months, so the yeasty aroma and bitterness may mellow out during that period. Regardless it's still a good looking and tasting quadrupel. I'm planning to enter this batch in two different competitions in 2017. One is the 22nd Annual Homebrewing Competition at Barley's Ale House. The other is the homebrew competition at the Ohio State Fair. In a future batch, I plan to use the other hops varieties (Styrian and Saaz) to handle the bittering to see if that removes the harshness. I'm also considering splitting the batch in half and adding oak chips to half of it to produce a barrel aged variant. I'm also wondering if the malt bill could be simplified, as it seems to contain more malt varieties than many other quad recipes I've seen. May 22: I am entering this beer in a state-wide home brewing competition. Although it is a tad more hoppy than I care for, I suspect that most judges would say it's "about right" in that regard. I'll know in mid-to-late June, and will come back here to update the post when I get the results of judging. June 4, 2017: Today I received my judging results from the 22nd Annual Afternoon with the Brewers competition. This beer took third place among all the entries, of all the styles. Although I had also entered it in the Ohio State Fair for 2017, it did not place among the top four Belgian Strong Dark Ales at that competition. Overall Impression: Rich, smooth, and well-attenuated. The fruit and spice characteristics are a bit subdued for the style but this is an enjoyable and drinkable beer. I'd drink a glass. Score: 7/10. Appearance: Fluffy tan head with excellent retention. Dark tan, medium clarity. Overall Impression: A solid beer and a fine example of the style. No obvious flaws - a pleasure to drink. Check ferment temp (phenols) perhaps, but don't go crazy about that. Good stuff. Score: 8/10. At the state fair, I received an official score of 24.5 for the beer. Given how well it scored at Barley's, this is interesting. Aroma: Medium sweet malt up front, mostly caramel, very mild dark fruit, subdued, not complex. Score: 5/12. It's interesting to note the difference in scores here. The judges at the Barley's competition scored the flavor almost twice as high as those at the fair. This is for bottles from the same batch, bottled at the same time, and judged one day apart (the fair judging one day earlier than Barley's). Increase mash temperature: This version needed more body. It just doesn't feel like a Quad when you're drinking it. It's not watery, but not the nice full-bodied mouthfeel you expect from a Belgian Quad. Increasing the mash temp should help with that by reducing the amount of fermentable sugars. Change the fruit addition: The raisins I used in the v1.0 recipe gave better flavor than the ones used in this one. I think for the next version I'll add an entire pound of prunes instead of a half pound of raisins. I'll also add them late in the boil so the aroma hopefully stays around. Change the grist a bit: I want more Special B flavor in the beer and more dark fruit. Using the prunes will help with that, but shifting the grist to include more Special B will help. Adding more candi syrup might help also. I don't want to make huge shifts here, and will probably only change about 1-2 pounds of the overall grain bill. I'm planning to drop the Caramunich Malt by about 25% to hopefully reduce the "cola" flavor some judges noted. Fresher ingredients: I took a small hit for oxidation. That may be due to the age of some of the specialty grains or even the base malt. I'm not sure. I got some good deals on grain in mid to late 2016 and bought what I thought I'd use within six months, but some of that's still around and it may be oxidizing. Next time I brew this for competition, everything should be fresh. Yeast starter: In the interest of time, I didn't do a yeast starter for this beer and I think it may have suffered some as a result. Next time, I'll calculate and use an appropriate-sized starter. Fermentation temps: I often let my Belgian beer fermentation temps run wild, as do many of the monks in Belgian monasteries. On the next one, I'll try starting low for the first 3 days and gradually ramping up. That's easier now that I have a controller I can program to change the temps automatically over time. Shift the hops additions: I got the comment "no hops" a lot about this beer. It actually has as much hops in it as anything I brew, but it's pretty clear the aroma and flavor characteristics aren't coming through. 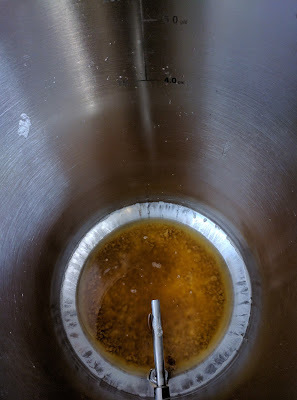 In the next iteration, I'm going to use a very small bittering addition and larger additions later in the boil. That should let more of the noble hops through in both the flavor and aroma. I think these changes will get the Quad a lot closer to what I want it to be.